Belt Tension testers are for checking tensions on your synchronous belt drives and V-Belt. Tensioning belts on a drive is an easy procedure. Simple rules will answer most requirements. 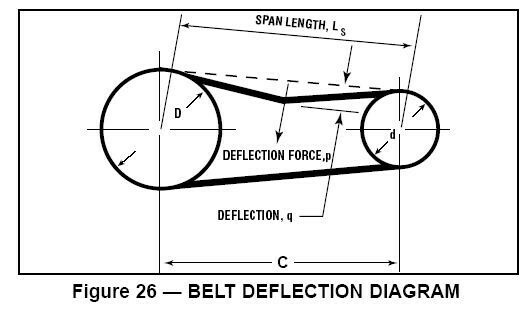 How to tension a belt correctly? If a V-Belt slides, tighten it. Thanks to the Gates Sonic Tension Meter you can easier get consistent and accurate tension readings. It analyzes the harmonic distinctive of a vibrating belt and gives tension measure. Just strum the belt like a guitar cord and the Sonic Tension Meter does the rest. The force and deflection method is the only faithful way to test tension. Of course, it needs a tester, some muscle, a piece of cord and at least three hands. A belt, like cords, emits a natural frequency vibration based on span length and mass. 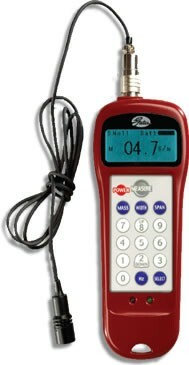 The Gates Sonic Tension Meter converts the frequency to a measurement of belt tension. First, inform span length, mass constant and width into the meter by using the keypad. Then, hold meter sensor to belt span and slowly strum belt to vibrate it. Push “measure” button to get the reading and the meter rapidly converts vibrations into tension.. Readings are displayed on a liquid-crystal screen. 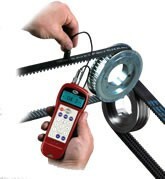 Similar to the size of a mobile phone, the Sonic Tension Meter can be operated by a unique person for a fast and accurate reading on all types of belt drive systems. * Operate the standard cord sensor to reach inside tighten areas where traditional measurements are impossible. A flexible sensor can be used and repositioned for practical use, one-hand operation (optional). An optional inductive sensor to measure tensions in windy or high-noise environments can be used. *Recommended for Gates belt drive systems only.